terraforming (v.)- to alter the topography, atmosphere, or ecology of a celestial body in order to make it habitable for terrestrial life. In recent years there has been a lot of interest in catalyzing synthetic landscapes, post-natural futures, and next nature, and fusion ecology. Coupling that with the concomitant interest in geology as architecture’s new ally leads to one inevitable idea- TERRAFORMING! Evidently terraforming was first put forth by Carl Sagan in the 1930’s when he speculated on the possibility of seeding the atmosphere of Venus with certain microbes that would eventually create habitable space on the hot planet. While this particular idea was later debunked, the concept was later legitimated by NASA (not to mention loads of science fiction work) in a series of papers considering the possibility of terraforming Mars given the discovery of polar ice. Thes papers propose that terraforming be better understood as “planetary ecosynthesis”, a move that acknowledges that human habitation. However, what interests us today are two examples of large scale ecosynthesis from the heart of Appalachia. 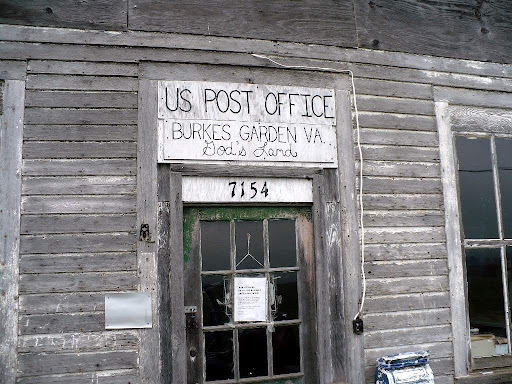 Deep in southwestern Virginia, on the edge of coal country, there is a place called Burkes Garden. Burkes Garden is a valley more than 3,000 feet above sea level, the highest on the east coast. 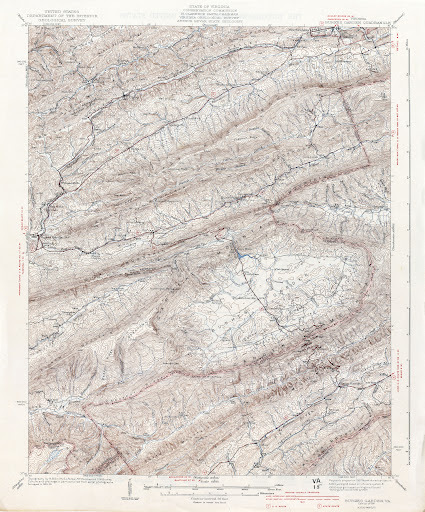 The valley was created when the limestone and shale that once formed a huge peak slowly eroded and collapsed in on itself, leaving only the harder sandstone rim surrounding what is known as a “doubly plunging anticline”. This geologic process created soils that are similar to the Tidewater coastal region, but at an elevation of over 3,000 feet. These conditions offer not only some of the most fertile ground in Virginia but also harbor species that are evidently unknown elsewhere. 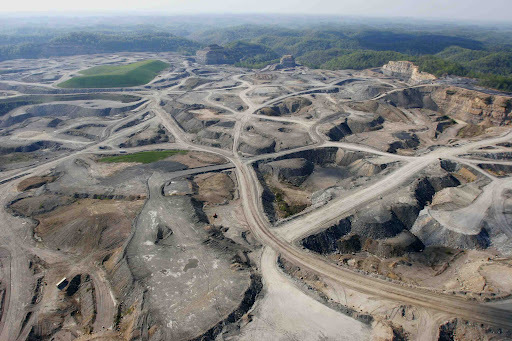 And morphologically, it weirdly resembles another landscape typology found throughout coal country- the strip mine. Just down the road in Wise, VA there numerous mountains whose peaks have been removed through an anthropological process. Mountaintop removal has been going on in the area since at least the 1960’s, and the number of sites was ironically increased by the Clean Air Act, which created a demand for cleaner burning anthracite and bituminous coal. The effects in the form of acid mine drainage and the spread of an aesthetic of violence are well known. What is taking shape might be called anti-terraforming, that is, the deliberate alteration of the topography, atmosphere, or ecology of a place in order to make it inhabitable for terrestrial life. Interesting and serious work on these landscapes is underway by people such as Julie Bargmann and the Virginia Department of Mines and Minerals, and we hope that the tenor emanating from the GSD’s most recent infrastructure symposium indicates a more widespread interest and willingness to grapple with these landscapes more fully. The possibility to use the material from another industrial scale excavation operation- limestone chips- to remediate acid mine drainage (amd) is established, though not without its limitations. As the limestone is exposed to acid mine drainage its surfaces rapidly become coated with an Iron oxyhydroxide coating and its effectiveness diminishes to nothing. But we are curious to see what fantastical futures might be wrought by design studies taking a sci-fi approach to mountaintop mine reclamation. If coal mining is a form of anti-terraforming, how might architecture and landscape practice contribute to the development of large scale ecosynthesis projects in the scoop out bowls of Appalachian mountaintops? Is it possible to develop a 1,000 year long real estate project that prepares a mine site to become another of “god’s thumbprints” in coal country? Perhaps when all of the coal is gone in 2073 Appalachia could become a network of distributed sites built on high, fertile ground, home to strange fusion ecologies and monster bucolic landscapes, refuges for long lost amphibians, cave beetles, stoneflies, boboheads, and loggerhead shrikes, great hydrological and biological reservoirs for the east coast.